This time two weeks ago I actually spoke the words "I miss the snow" out loud. A New Englander, born and raised, later transplanted to the Windy City... trust me when I say, I've experienced some brutal winters in the past. So it really comes as a surprise that now that I'm living in Ireland, I am somewhat sad to see that snow has disappeared from my life! I know what you're probably thinking- SNOW WAY! What I most certainly did not miss was the freezing temperatures that typically associate themselves with snow. I didn't miss breaking my back while shoveling the car out of 3' with a 5' snowbank piled around. I did not miss the required 7 layers of clothing and later trying to find a place to dry all the dampness out. There Is a whole list of things that come along with snow that I definitely did not miss, at all. However, I would see friends from back home posting photographs of this season's snowfall and it made me miss building a snowman. And having a playful snowball fight. 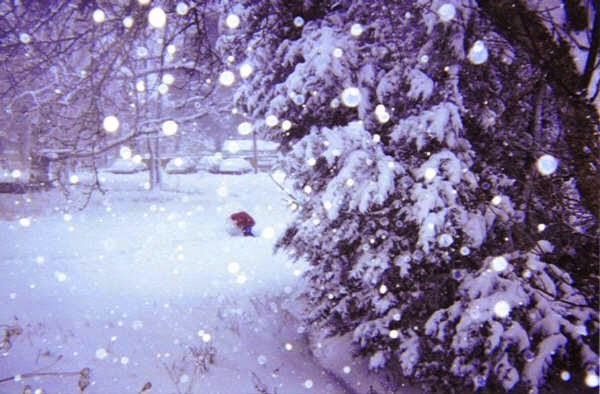 And dare I admit that I would have loved very much to lie in the snow and wave my arms around to create that snow angel from my youth? Here in the part of Dublin that I live in, we've experienced snow twice this winter. The first snowfall started and stopped faster than you can say "Do you want to build a snowman?". The couple of flakes that did fall, melted as they touched the green grass. I didn't even have time to take a photograph of it. Then we got our second snowfall a couple of weeks later. Oh it accumulated to less than a half inch, but hey it was something! I bundled the kids up and we ran outside. Our yard is pretty tiny so I hopped into the car and we drove to my in-laws, who live across the street from an open field. It was perfect because the field was empty, completely untouched. We probably looked like a couple of fools running around, our mouths open wide, tongues hanging out as we tried to catch snowflakes, but at the time I didn't once think about those awful snowy winters from my past. The kids reactions to the snowfall was pure excitement. Their red little noses didn't care that they were cold. Since there is no real need to own snow boots here, they were slipping and sliding in their wellies, but again, they could have cared less what was on their feet. They were playing in snow!!! It was all that mattered to them. We had a snowball fight (even if it took half the lawn to make a single snowball). We built a snowman (albeit a 10" miniature). But the kids had one of their most joyful winter nights on that snowy evening. The following morning when we woke, the kids ran to the windows, hoping for more snow but alas, it had all melted overnight. Now I'm sure that my friends and family in New England are shaking their heads in major disbelief. How foolish do I sound as I try to romanticize the snow when you've all had one of the most awful winters in years! I know you are all sick of the snow and what I can only imagine feels like the looooooooooooooooooongest, most miserable winter, but for just a second, think about how fortunate you are to have experienced a lifetime of building snow forts and going ice fishing, ice skating and snow shoeing. Can you believe that friends of ours have never been in a snowball fight? Never been sledding? Now I'm not that naive, of course I know that there are millions of people in this vast world of ours that will never experience a snowfall, but I never imagined that my own children would be among those who don't get to regularly play in the snow. Luckily for me, there are ways to supplement this missing piece of my traditional winter. One way to add a bit of snow into my life was discovered when my auntie recently surprised us with a bag of Snow To Go, a super-absorbent polymer that becomes artificial snow when you add water to it. The directions simply read "Just Add Water". Armed with a dishwashing tub and some toy cars and figurines, I set up a little play area for the kids. My 3 year old helped me mix the powder with the water and within seconds, we had "snow"! I set up a couple of little play scenarios. First was a construction truck station and some Peppa Pigs figures. The second was an iceberg with penguins and polar bears surrounded by water filled with whales, fish and other sea life. While this faux snow wasn't moldable (unlike a great snow recipe found on Pinterest that we had previously attempted), this packaged version was still quite fluffy, a bit slippery and plenty interesting to play with. The snow itself was cool to the touch and did not melt. It was not sticky either. The packaging actually claims that the snow lasts for a few weeks once made, but I didn't bother storing it as I still had loads leftover from the powder to make another batch some other time. My daughter played with the set up for almost 2 hours, and she only stopped when I cleaned it up before the almost two year old woke from his nap. Although the label says that the snow is non-toxic, it clearly states "do not eat" and that the "unsupervised use by children is not recommended". I just didn't trust my son to abide by those directions! For about 8 Euro, this faux snow is not cheap, but it was a great indoor playtime option and I look forward to making up another batch again soon! I could also imagine that the fake snow would come in handy for a Christmas craft, like making these darling Snow Globes. Prior to the Snow To Go use, my kids and I had made some snow using a baking soda & hair conditioner recipe found on Pinterest. Below are so photographs of those attempts. I have to admit that I prefer this version of faux snow for it's malleability and also because with just two household ingredients needed, it's an inexpensive option. An added bonus is that the addition of conditioner makes your hands so incredibly soft! 3 cups baking soda + 1/2 cup hair conditioner = snowy times! Have you ever tried making your own snow? What recipe did you follow? Or are you so completely and totally sick of the winter that reading this post is making you think I am slightly evil :) ? Let me know in the comments section below! I should mention that an unexpected trip brought me home to Rhode Island last week so I can now admit that while I genuinely thought that I missed the snow, after 3 significant snowfalls in only a handful of days, I can guarantee you all that I will never again mutter the words "I miss the snow" again! Love this, and the snowball fight with grampa amazing! Who doesn't love a good ole snowball fight?! You're crazy!! I haven't had to deal with it anywhere near to what you have but I'm sick of snow for you! Haha!